Zumba has launched its first photo contest to celebrate National Dance Day on July 25. The company pioneered workouts to dance music will select 50 winners "based on creativity" to be published on its Instagram, Facebook and Twitter pages and receive a Zumba swag bag. We've asked Zumba to clarify their copyright policy as well. You can follow the contest with the Twitter hashtag #NationalDanceDay. 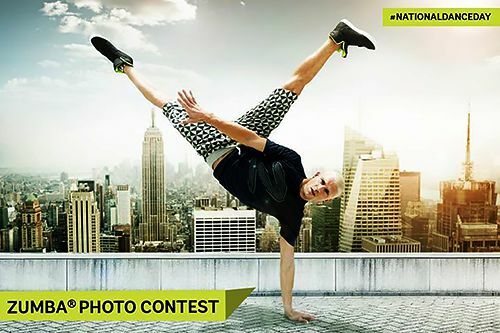 Global fitness leader Zumba just launched its first-ever photo contest to celebrate National Dance Day on July 25. Whether striking a pose in front of Mount Rushmore or leading a class in the Big Apple, Zumba is giving people the chance to show us how Zumba moves you, now through July 23. Fifty winners will be chosen based on creativity. Their photos will be reposted on Zumba's Instagram, Facebook and Twitter pages and will receive a photo credit. Winners will also receive a Zumba swag bag! Photo must be shot at a unique setting in the United States and/or other countries different from a Zumba Class setting. (eg. at Yellowstone National Park, Rooftop building, etc.) Get creative! Photo can include an unlimited amount of people as long as it captures the essence of what Zumba is. Photo must be in color. The bolder the better! Terms and Conditions: By entering, you represent that you have the permission of everyone appearing in the photograph and expressly permit Zumba to post the photograph on Zumba's Web site and/or on its social media pages. Void where prohibited. No purchase necessary to enter or win. Follow the contest with the Twitter hashtag #NationalDanceDay.